Road trips. There’s something about the idea of a road trip that makes many people, including myself, go nuts from intense excitement. Just the thought of a road trip triggers such giddiness and ecstasy that I immediately start dreaming of all kinds of magical road trip scenarios. And I can get lost in such thought for hours. Usually, what makes me so enthusiastic about a road trip has nothing to do with the region where it might take place or the vehicle I’ll drive or the route I’ll take. It’s the absolute freedom that gets me, and perhaps you, going. The freedom to go wherever we please, to stop whenever we want, to be in complete control of our travel experience. Our brains find this idea so unbelievably appealing it seems. Try saying ‘road trips’ without getting genuinely excited, even if you don’t have any plans to take one. Over the years, I’ve been fortunate enough to embark on several road trips. Australia, Thailand, Romania, Mexico and the USA are just a few of the countries where I’ve been able to enjoy that freedom. And today I write to you from Los Angeles, California, the city where my next road trip shall begin in 2 days. My girlfriend and I flew out to LA last night from Florida. The main reason for this visit out west is for a family event taking place in beautiful Mendocino Country, way up in northern California, in about 10 days from now. About a month ago, after confirming we would attend the family event, we came upon the idea of not only adding a road trip to our visit, but renting a camper van to do it with. This would be a first for both of us. So I did a little research and quickly discovered Lost Campers USA. I sent them an email and received an immediate response. After communicating with them for a week or so, it was obvious that this was the camper van company to use out in the western part of the USA. If you look at the Lost Campers website or Facebook page, you’ll see why I quickly became hooked on their laid-back, family-owned style and their very clear dedication to making road trips affordable for travelers on any budget. And with thousands of overwhelmingly positive reviews from other travelers, it was an easy decision and we went for it. We won’t be traveling in a huge RV. Lost Campers rents small camper vans, like converted minivans, complete with everything you would need for a road trip – comfy bed (with so many positive reviews about their beds, I’m curious to try it out), sink, storage, a table, awning, cooling chest and more. Their rates start at around $37.99 USD per day, which is remarkably inexpensive for both transportation and a bed! Once we get set up with our van, we’ll just start driving. We only have 6 days for this road trip and we need to head north to end up in San Francisco. However, we don’t have much of a plan. We have no idea where we’ll spend our nights and we only have a vague idea of the route we’ll take. Some possible stops include beaches, the Hearst Castle, a winery, the Henry Miller Library in Big Sur, a seldom traveled dirt road through the mountains (looks like an awesome recommendation from the team at Lost Campers! ), Monterey and a National and/or State Park or two. If we make it to all of that, great. If not, that’s perfectly fine too. Let’s hear it…what’s your most epic road trip experience? If you’ve yet to take one, where would you love to do a road trip? I live in New Zealand, and any time you drive over the mountains in New Zealand it’s a pretty epic road trip! Driving from Auckland to Wellington is pretty fun, and if you want you can even load your car on the ferry, head to the South Island, and keep driving all the way to Invercargill or Bluff! I took a combined road / sea / train trip last year across the North and South Islands, and it was great! Totally with you on this one!! Road trips make us lose our minds too!! We love them and have done quite a few over the years including the Great Ocean Road in Australia, we spent 3 weeks travelling around New Zealand in a campervan and did a California road trip very similar to yours in July! It’s exciting not knowing exactly where you’ll end up or what you’ll see along the way! For instance we drove thorough an epic thunderstorm in Monument Valley in the USA which turned into the most amazing sunset we’ve ever seen! Love following your adventures, keep it up! About a year ago, I embarked on a month-long road trip through the Western United States (my home all my life) that totally changed my perspective on road trips. I’ve always been drawn to the freedom of the road too, but I hate driving! So we worked out a route where I wouldn’t be behind the wheel more than two hours a day and it was beautiful and totally stress-free. 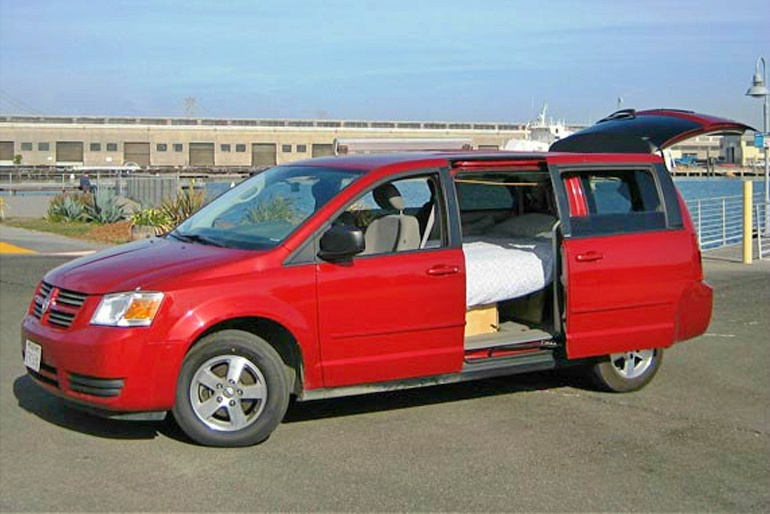 I’ve never used a camper van, but we often sleep on an air mattress in the back of our crossover SUV and it’s surprisingly luxurious (allstays is great for finding places to park overnight, like Walmarts and National Forests). I hope you enjoy your trip! There’s so much to discover in California that I keep making excuses for more road trips there! Hey Katie – With 2 hours of driving per day, that’s quite nice. Plenty of time to just enjoy your surroundings without speeding through them! We went on a 9-day road trip through Utah and used Lost Campers – we had such an incredible time. Hope your trip was just as fantastic! Hey Rebecca – That’s excellent to hear…definitely a great company! Seems like you’ve had an amazing trip. Thanks a ton for sharing, it’s kinda inspirational. The last time I did a road trip was two years ago. It was a two-week trip with three friends across half of the length of Java, the world’s most populous island. Even so, we were pleasantly surprised to see how many places we went to were not overrun by tourists. In two weeks we explored thousands-year-old Hindu and Buddhist temples, ancient royal palaces, intriguing art museums, scenic crater lakes, and Dutch colonial buildings among other things. Oh and the food! This post of yours is the second post about road trip that I read in the past week. I wonder if it’s a sign that I should plan another one sooner than later. Thanks Derek! I would say our most epic road trip experience was when we went to America for the first, and only time! We went in January and had a most fantastic time. We picked up a huge American car in LA, stayed at the oldest hotel, did all the sights, went to Disneyland, then went to four National Parks and four states of America – California, Utah, Arizona and Nevada. Best bits – Route 66, San Francisco, and snow on Yosemite National Park! Oh, and Vegas was pretty nifty in a weird type of way! Thanks Steve! We did a short part of that path actually but mostly in the Redondo Beach area. It was an excellent place to hang out. We just returned from a 2 week road trip from Seattle. We stopping in Casper to watch the Eclipse (with a friend we met on one of your tours!) to SE Colorado to visit family, to Yellowstone National Park, to SE Washington state to visit friends then back home. Minus all the wild fire smoke it was a great trip. Our favorite road trip are down the Oregon Coast, it’s so stunning. And twice we have taken a month and driven up to and around Alaska, a trip everyone should do at least once. Enjoy California’s beauty and travel safely. Hey Jeanette – I could see how the Oregon coast would be a favorite road trip destination! I loved that area when I went on a short trip a coupe of years ago. Glad you enjoyed your latest travels!! Traveled across America from Maine to Montana twice, and going acro Canada from Alberta to Nova Scotia – love North America! Most epic road trip! Two years ago we were supposed to fly to Lanzarote from the UK for a fortnight of sun and sea. The travel company cancelled us 36 hours before our flight as the hotel wasn’t finished. Not a problem. We booked a ferry from Harwich to Hook of Holland, packed up the car, booked a night’s Airbnb, and took off. Our journey took us to Haarlam (Amsterdam), through Germany, Denmark, Sweden and into Norway and back via Maastricht and Belgium. We came back at sunrise along the bridge in Denmark that disappears into the sea and becomes a tunnel. We attended a boat party in Maastricht, we ate pizza in Norway, we met the kindest people in Maastricht when we were struggling to get tickets at the train station, we took a boat trip from Maastricht into Belgium, cycling in Gothenberg, witnessed the most amazing thunder and lightning I have ever seen whilst staying next door to a windmill in Haarlam. Met some wonderful people along the way. It was only a fortnight but a very, very special road trip. We completed a 60-day road trip in New Zealand last year in a camper van similar to yours – definitely the highlight of our travels during the past 3 years. In fact, it fired us up for organising another road trip this October/December travelling south through Patagonia on the infamous Carretera Austral road. More than a little excited! Would love to make it to the US for Road Trip 3 so will be looking out for your updates. Have a great one! I’ve had some fun road trips to NYC, Pittsburgh, Detroit, Indianapolis, Brazil, Belize, Peru, and parts of Europe, but nothing will ever top the road trips my family would take from Canada to Walt Disney World during my childhood. Man, what I wouldn’t give to relive some of those trips again! We just did a very simple conversion with a Ford Transit Connect and hit the road tomorrow for a 3 week test run. Heading to the Badlands and Estes Park. Going simple. I’ve heard great things about lost campers. Be sure to stop along the way in Big Sur because it is magical. Santa Cruz is a great town. It’s all good. Enjoy the ride. Totally agree with that feeling of freedom that you don’t have when traveling by plane, bus or train. The most recent one I did was with my girlfriend, from Nantes, France to Sofia, Bulgaria… in a small Open Corsa! We slept in the car or camped to save money. I loved it exactly because we were able to choose the road we wanted instead of the recommended one (from the north to Germany and Austria). Instead, we went to the south of France, Italy, Slovenia, Croatia ( the highlight of the trip), Bosnia, Montenegro, Albania, Kosovo, Macedonia and finally Bulgaria. However, the cost of the trip can get high very quickly, only with the gas. Great post, maybe you can follow up with a wandering earl top 10 road trips post! I too love the ultimate freedom of a good road trip. One of my favourites was a cross country trip across Cuba from Vinales to Baracoa in a Russian car rented from the government agency. At the time (during the special period) there was limited transportation options for Cubans due to fuel shortages, so we ended up giving lifts to many locals as we made our way. Met a lot of nice Cubans this way, even providing transport for some baby chickens. And the roads, including the main highway #1 was almost empty. Enjoy your trip out West. So close, yet not coming to Palm Springs…. (but as it’s hotter than Hell here now, probably a food idea). Hey Scott – Very close but limited time unfortunately! Enjoy your road trip on the PCH. I’ve done it a few times…..it’s been incredible every single time! Be sure to stop at the Sea Lion gathering spot and Hearst Castle is beautiful and if you make it to Big Sur (the road has been closed due to land slide) have a meal at Nepenthe. The view is a delight if it’s not foggy. There’s also a Hermitage in that area that was kinda neat to visit. Thanks Regina! Most of that is on our list and the landslide seems to make it difficult but not impossible to visit most of the coast. We’re up for adventure and the sea lions and Hearst Castle will hopefully be part of it! Haha, good follow up! I’ll let it slide this time. Thanks for following along! Let me throw in a suggestion. On the way up, I hope you stop in Santa Cruz. Very cool town, surfing, great food, UCLA campus so bookstores etc. From Santa Cruz take Hwy 17 up to Hwy 35, aka Skyline Blvd and hang a left (north) up Skyline. This is an incredible drive through redwood forests, great views etc. If you’re hungry stop at Alice’s Restaurant at 35 & 84 (you’ll see it right on the corner). You can take Skyline all the way to 92 where you have a choice of turning left to go down to Half Moon Bay and then Hwy 1 up the coast, or turning right for the freeways to get to San Fran faster. I’ve been all through there, and it’s incredible driving. And the forests smell wonderful. Keep your windows down. Have fun on your road trip. Hey Andy – Thanks so much for the suggestion! We’ll definitely stop at Santa Cruz. I’ve been there a couple of times and always a great place to visit. We’ll try to work in the Skyline as well, sounds like our kind of route! Hiya Earl~ I love a good roadtrip! I think I have gotten more therapy from long stretches pf asphalt than I ever have from paying a counselor. I believe we are all our own best therapists, and a lone roadtrip is a great way to get in touch with our issues and make leapyears of headway. We’re in Fortuna, just up the road, if you need anything. If you travel north of Mendo, stop by for a cup of coffee or tea! Thanks for that. If we do head north of Mendo, I shall let you know. Not sure if we have time with all the family event stuff but you never know. And as for the open road being a great therapist…it is without a doubt an ideal way to sort through our issues, clear our minds and hopefully make sense of things! I love road trips! Which is serendipitous considering I go on one every week for my job. The longest / most epic ones I have enjoyed are Missoula, MT to New Orleans LA, and Waterville, ME to Seattle, WA. With my next tour stretch, I will also get to go from Portland to San Diego! Thanks for inspiring me to take a job where I am on the road 95% of the time! Hey Cody – Not a bad part of the job I guess! A road trip every week…not too many people can say that. Enjoy the trip to San Diego and hopefully you’ll have some time to catch a little bit of the coast as well. Derek, Just checked and found that I’ve been following your blog since 2011! You’ve been up/down, everywhere. Now you get to try Road Tripping in California! Me too! I’m presently in Santa Rosa, CA, and living in my Truck Camper. I’ll be setting off on a two to three month loop through the Northwest in a couple weeks. I just returned from a five month trip through Southeast Asia and am now provisioning my camper to set off to see some of my own country. A little history of my Road Tripping: Six month loop around Europe in a VW Camper Van; A one year R/T loop to Costa Rica from California in a truck camper, and a couple four month R/T’s through Mexico in cars. Plus many more shorter trips. We’ve always talked about meeting up somewhere, sometime. Is this the time? As I’m very mobile; you tell me where you are and I’ll meet you there, but you’ve got to give me a couple days heads-up. I’ve met up with several other travel bloggers over the years, but you (my favorite) have escaped me. Is this the time? I’ve got a lot of this type of travel experience under my belt and would love to share. Just a little tip: You know that slow travel is best travel and 6 days is just a taste of what’s in store for you as you try out this type of travel. Yer gonna miss out on smelling the “California Poppies”. (Yes, we have roses here too). Hey Steve – That’s quite a road trip resume my friend!! Quite an impressive list of road trips, pretty much all of which I’d love to take myself at some point. And yes, 6 days is pretty short but it’s all we have unfortunately. As for meeting up, as soon as we have our post-road trip schedule I’ll let you know. I’m picking up family in San Fran and then going straight up to Mendocino with them. On the way back, I’m driving family back to the airport as well. But let me see how it all comes together and absolutely if I can make a meeting happen, it will happen. I’ve always appreciated your comments over the years and of course it would be great to say hello in person! Gotta love a good road trip! I too day dream for hours (often a week or more in advance) when I have a trip coming up. Doing the California road trip, “Wandering Earl style” will be great. Keep us posted with stories and photos of your campervan adventures. Thanks so much Tim! We’re really looking forward to this trip!! Have fun! I hope the road in Big Sur is in good shape. My recommendation is to take your time there – it took us 12 hours to get from Cambria to Monterey. My favourite road trip: 4 weeks driving from Montreal to New Orleans and back, stopping everywhere along the East Coast and in the mountains. Thanks Matt! I’ve looked up the road situation and most seems possible with some detours. We’ll see how it goes. And that sounds like an epic road trip to New Orleans and back…doesn’t get better than that! I get that serious rush of ectasy when I set off on a road trip. I thought I was abnormal. Thanks for confirming I’m sane after all. The flip side of this excitement is the envy I feel when I see people boarding train, cruise, plane or any other longhaul means and I’m not. If there’s one time I’m overcome with envy, is when I have to watch strangers leave…haha. hanging out at the airport or any port for that matter is a very bad idea for me. Hey Rose – Definitely not abnormal!! I think most of us feel the same way. And yeah, watch where you hang out. Although, the more people you see leaving on various modes of transportation, maybe the more motivated you get to do the same as often as possible? !